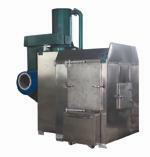 The small scale incinerator combustion capacity 10 kgs per hour to 50 kgs per hour. 1. Oil means Diesel oil fuel. Gas means natural gas fuel. 3. Average Capacity calculated by medical waste, not mean any waste material. The animal/pet combustion rate around 2/3 of average capacity. 4. Clover incinerator use time per day up to 12-16 hours or 6-8 feed times. Between each feed/combustion time, there are about 0.5-1 hours cooling time. 5. Generally, we proposal small laboratory, small clinic use capacity under 20 kgs per hour. When incinerator use in hospital, please calculate the waste output capacity around 2kgs per people per day. If there are 200 sickbed in the hospital, that's mean you need one incinerator capacity around 400kgs per day, change to capacity per hour is around 30-40 kgs per hour. According the operation time per day, waste material, budget, development,etc, you can use capacity from 30-50 kgs per hour incinerator.